Life first evolved about 3.5 billion years ago, at the beginning of the Precambrian Eras. At first, life was made up of simple microbes (bacteria) that could survive horrible conditions, including acid oceans and no oxygen in the air or water. For 2.7 billion years, the sea bottom remained (mostly) peaceful, quiet and flat. Microbes built wide mats that sealed the mud surface, stabilizing the sediment. Advanced microbes like blue-green algae began pumping oxygen into the atmosphere and ocean. The microbes had few enemies — no big, energetic animals disturbed the bottom. Day after day, week after week, year after year, bits of sediment kept falling down through the ocean water. 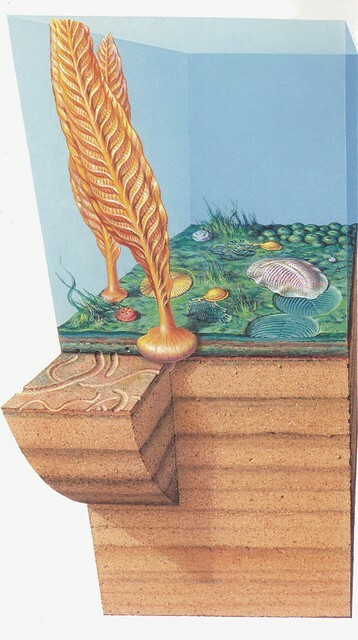 The clay and silt continued to make layer after layer of sediment, and the ecosystem was stubbornly two-dimensional — all life lived on the surface or the bottom. The subsurface was empty. Then, around 700 million years ago, the Vendian Period began. A few life forms like Charnia and its kin got up to a half a foot tall, acquiring the shape of bloated feather plumes. Still, no one was churning up the mud or otherwise disturbing the microbial mats. 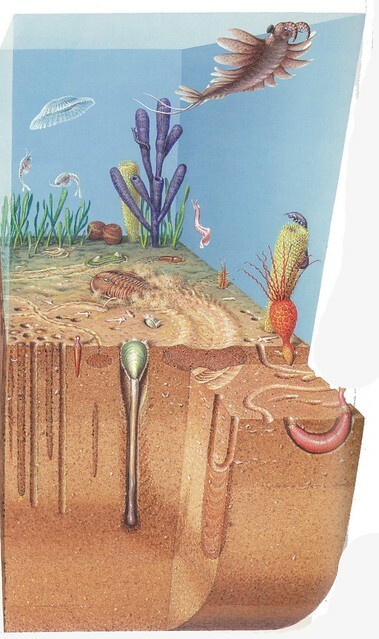 Life in the Pre-Cambrian still was lovely, idyllic and BORING! Today’s oceans teem with life forms that burrow through the bottom mud and live in cleverly constructed holes. Thousands of creatures, large and small, plow through the sediment looking for food. Plowers and burrowers include snails and bristle worms, long-necked clams and sea-cucumbers, plus a bewildering variety of groups without common names. The Precambrian world was totally devoid of all this action. Finally and suddenly 540 million years ago, the Precambrian peace was broken. The Vendian Period ended when the microbial mats were attacked and ripped apart. Holes were excavated down into the mud. Bottom sediment was churned up. The long reign of the soft, quiet, two-dimensional world at last was terminated. The Cambrian Explosion had begun. From this moment on, the rules of life were changed, and the ecosystem went into 3D. Dozens of new species evolved to take advantage of living deep in the mud. Other species hunted the species in the mud. Still more species swam above the surface looking for prey hiding below. Trilobites appeared and flourished. Fishy-things evolved. Who destroyed the Precambrian mats? Who released the potential of evolution? Where do we send the thank-you note? The fossil burrows are clues. At the end of the Vendian and the beginning of the Cambrian Period, U-shaped burrows appear all over the globe wherever shallow seas existed. Something was diving down through the mats and coming back up, again and again. This was the burrower who was destroying the ancient system of mats. There are suspects alive today that make U-shaped burrows quite like the ones that ripped apart the Vendian bottom. Usually these critters are no bigger than a small pickle. Under the microscope, these burrowers look as fierce as the man-eating worms in the movie Tremors — the beasts have stout, muscular bodies with a face that carries a scary array of hooks and barbs. When they bump into prey, the hooks snag on their victim and the whole face inverts, dragging the meal into the throat. You can find these mini-monsters in the mud in most oceans. Technically, they are called “Priapulida,” but they have many nick-names. Our favorite is “cactus worms.” Because they have no bones or hard shells, cactus worms have almost zero chance of being fossilized unless there are very special conditions. 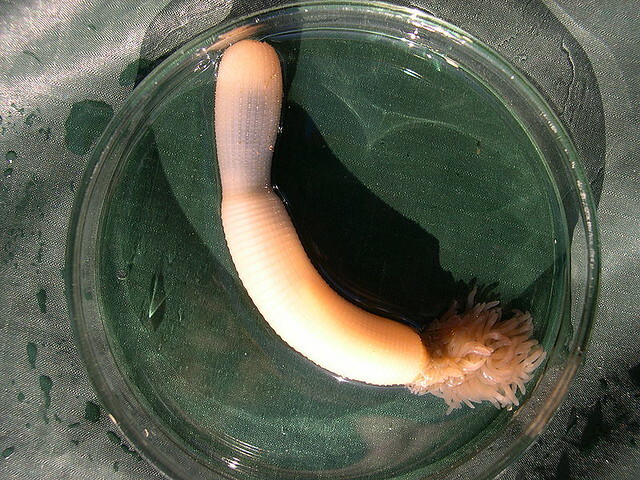 The cactus worm would have to be buried instantly by an underwater landslide that killed the worm and sealed it under a thick blanket of sediment, keeping out any scavengers. For the first century of paleontological explorations, up until 1909, no one could find such an avalanche bed. Then Dr. Charles Doolittle Walcott, Cambrian expert from the Smithsonian Institution, hiked up into the Canadian Rockies near Burgess Peak in British Columbia. He was looking for Cambrian trilobites, his specialty. He found what he was looking for flattened in dark slabs of clay, but there were other species, too — animals with no shell or hard parts at all. Most exciting were the worms. Dozens of kinds of worms. Worms that ate microbes. Worms that ate trilobites. Worms that ate other worms (“Lutheran Worms”). Walcott had found the Holy Grail of Cambrian history. But was there evidence of cactus worms? Yes! Now we knew for certain that cactus worms had thrived in the transition from Vendian to Cambrian. We could be sure that these worms had overturned the Precambrian peace and begun the Cambrian Explosion. They may be ugly, but remember these little creatures; they were the dynamos that restructured the oceanic world.